You have glowing skin and gorgeous hair. Share with us your haircare and skincare routine/secrets. Thank you very much. If I’m honest I just try to keep my hair and skin really clean, there’s no major regime really, but I do find drinking water, working out and jogs outside really help my skin glow too. I also try have a couple of days make-up free a week to let my skin breathe. You have a sports nutrition range coming out in February. Would you like to enlighten us about this new endeavor of yours? What are your favorites from the range? 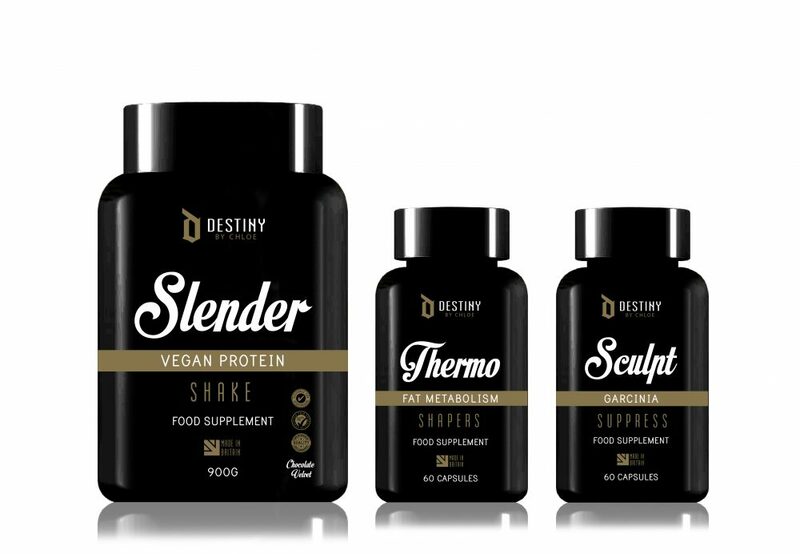 Yes, I’m really excited to launch my nutrition and supplement range! I’ve been working on it for ages, I named it ‘Destiny By Chloe’, Destiny is my daughter’s name and it’s also a word I believe in because I believe we all create our own Destiny. I’ve been using my products myself and found them so beneficial. It was hard to find something perfect on the market that was suitable for vegetarians/vegans that was natural and safe but that also gave insane results – so with the help of some amazing nutrition specialists, I have been able to create my own range instead . I’m really loving the Slender Protein Shake, I have one a day. It’s vegan, has 25g of protein, has zero sugars and very low carbs and contains less than 120kcal per serving – perfect for after a work out and stops me from snacking on unhealthy convenience snack foods. The Thermo Fat Metabolism Shapers are a miracle product, they assist with weightloss and fat burning and are totally safe. They have really helped me intensify my results and maintain my figure. It’s great to start seeing a difference in my body. The last product I want to rave about is the Sculpt Garcinia Suppress capsules which are fab because they curb the appetite, can help act as a fat blocker and increase serotonin levels which make us feel really happy. Just a natural, safe, feel-good boost! What’s not to love, right? It’s hard to pin point one really.. I have so many that I love the look or style of, I also admire many women for how they handle the business side of things, I just like to see woman do well. I favour some from each era. You have recently been placed among the 25 Sexiest Women of the Year 2016 by dailystar.co.uk. How do you feel about that? It felt great, it’s always lovely to be complimented. My image/look is based on what makes me happy, I dress for myself, but it does feel really nice to be recognized and appreciated by others too.